Whirlpool bath or Air Bath? Huge Selection of America’s Best Whirlpool Bathtubs including the 6032 elite, walk-in whirlpool bath, european massage bath tubs and combination whirlpool baths. When remodeling, the 6032BW acrylic whirlpool bathtub fits or replaces the standard fiberglass one piece unit found in most homes that occupy a 60 X 32 space. This tub has two arm rests and a soap dish designed into the acrylic. Its 5 foot length and 32 inch width make it a perfect replacement for any standard size tub. 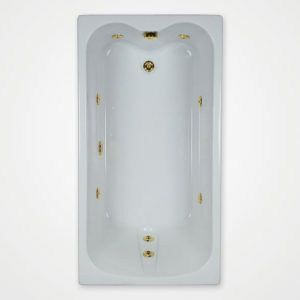 Our best selling whirlpool bath because it can replace your existing standard bath and also fits into small spaces. The bath dimensions are 60 inches by 32 inches. 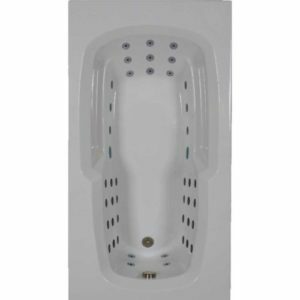 The top overflow/end drain design gives our Elite tub the largest interior bathing area of any comparable 6032 whirlpool therapy bath on the market. All WaterTech Elite tubs have our exclusive top overflow design which allows each tub to increase their water depth by at least 4 to 6 inches. Popular options ordered are an In-line Heater with Ozanater and jet finishes in Chrome, Nickel, and Bronze. For more options click on our accessories tab. A beautiful bathtub for the smallest of spaces! WaterTech manufactures three models that are 60” in length and 32” in width. These are the 6032BW, 6032 Ultra and our exclusive top overflow bath the 6032 Elite which provides the deepest water depth of any model 60” long and 32” wide. All WaterTech 6032 baths are excellent choices for individuals wanting to replace an existing fiberglass, one piece tub/shower with an acrylic jacuzzi style whirlpool. If a shower is desired, it can be incorporated into a shower/bath design in all our models. WaterTech’s Physical Therapy Bath has been developed for the individual who wants or needs an intensive high pressure hydrotherapy massage. The bath can be filled with either HOT or COLD water to help in the treatment of postoperative orthopedic rehabilitation, pediatric disabilities, arthritis, fibromyalgia, or any type of spine or musculoskeletal pain. Available in various sizes & shapes. Call for pricing. Note: Prices do not include freight. Please call for pricing. Four inches wider than a standard jacuzzi style whirlpool bathtub. This jetted tub’s dimensions are 60 X 36. Perfectly suited for narrow spaces and one person. Three back jets provide a powerful back massage and four jets massage the legs, hips, knees and torso. Two jets provide the feet, ankles, toes and soles of the feet a comforting water massage. 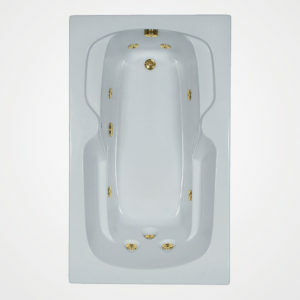 The top deck of the tub has two sculptured areas designed to conveniently hold soap, shampoo, conditioner etc. Tremendous leg room and an extra wide bathing area. The tubs external dimensions are 60 inches long by 36 inches wide. The top overflow, a WaterTech exclusive design, lets the bath water depth to be increased by as much as 4 to 6 inches. The drain and top overflow are at the foot end of the tub. The bath is designed for comfort with two arm rests and 5 jets for the back. Examples of the numerous options available are: LED Mood Light, Heater with Ozonater, etc. For more options just click on our accessories tab. 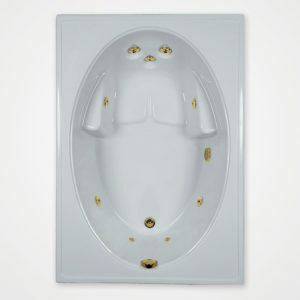 Whirlpool bath with a roomy area to relax in with 11 jets providing a full body massage. The tub dimensions are 60 inches long by 42 inches wide. 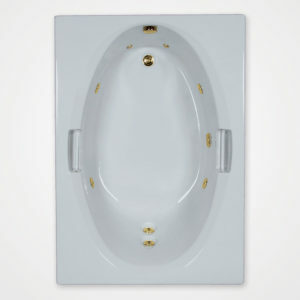 All the back jets are recessed and the foot end of the tub is curved where the top overflow and drain are located. A top horizontal overflow allows for the water depth to be increased by 4 to 6 inches. Review additional photos and drawings to view how easily a 6 foot person fits into the tub. Options available can be found by clicking on the accessories tab. 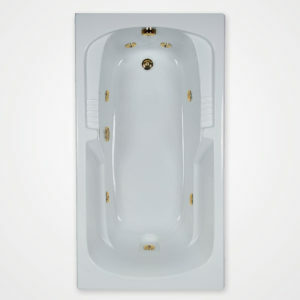 This elegant jetted tub’s oval shape is 60” long and 42” at its widest points. 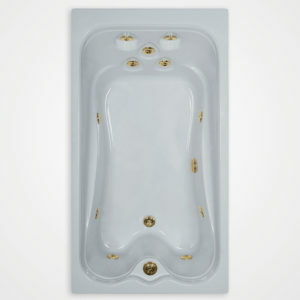 The tub was designed to be deeper than most other jacuzzi style tubs the same size and accommodates one person. For those wanting even a deeper water depth, the tub can be ordered with an optional press-flow drain/overflow assembly that will increase the water depth an additional 3”. 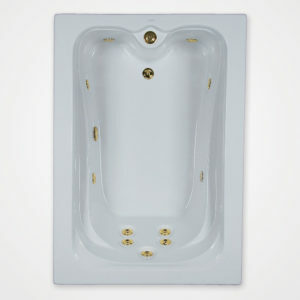 A very popular jacuzzi style one person whirlpool bath! 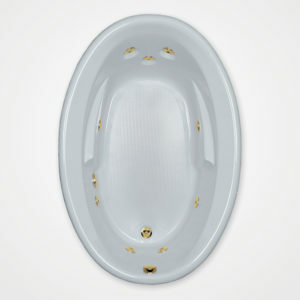 We have 4 models of the 6042 jetted tubs: the 6042 Elite, 6042EOW (oval shape), 6042 GW, and the 6042 SW. The 6042 GW is the only 6042 whirlpool that has two clear acrylic grab rails designed into the acrylic tub. Wide tapered arm rests and a sculptured seating area, in the floor of the tub, cradle your body. A 5’ tub with a large deck area where a faucet can be installed. This jetted tubs rectangular shape is perfect for those wanting to place a shower over it.